Hello, everyone! I don`t remember if I got the chance to tell you this, but last month I got accepted as an official reviewer by Oftomes Publishing. Each month we have a readathon, where we read and then review the book of the month. From what I gathered, the books in question go on sale before we start the readathon, so you`ll probably get them for less than 3-4£ on your Kindle. When choosing the books to publish, Ben has a good eye for unique and compelling stories. It`s the main reason I wanted to read the books. But also, every now and then, you need a break from the hyped YA novels. So it`s nice to discover new books and authors. 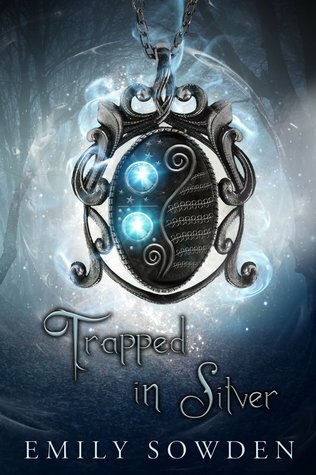 "Trapped in Silver" is a beautiful fantasy story that combines magic, romance and a solid world building. If you`re a fan of "Supernatural", then this is the book for you, as it features demons, shapeshifters, Berzerkers and other magical creatures. I have to say that the pacing feels slow sometimes, but I`m always more interested in the characters anyway. Being the first book in a trilogy, you could tell that this is an introduction to the world and it was setting everything in motion for the next two books. The main character is Ava, a girl that was always looked down on because of her upbringing. Ava lives in a world where women are treated like property. Her mother has passed away and her father is always away on business. The only one she can count on is Roan, a boy her father adopted a few years ago. They live on a secluded farm and like I said, people see them as filthy. On top of that, Ava suffers from terrible nightmares and is sometimes afraid of losing her mind. But when she meets Ethan, a strange and somewhat dangerous boy, her world is about to change. Now, I know what you`re thinking: another pointless YA romance. But take it from the girl that hates romance, this was beautifully executed. The banter between Ava and Ethan is always fun and it`s the type of love/hate relationship that works in this context. They don`t meet one day and are madly in love the next. No. They bicker, they fight and it takes them a long time to trust each other. For the most part of the story, I really liked Ava. She`s sarcastic and isn`t afraid to express her opinions, despite the repercussions. Whilst she is feisty, she does find herself in danger most of the times. Not really a damsel in distress, but more of a trouble magnet, based on her bad decisions. Ethan was another character that I liked and the one that had the biggest character development, in my opinion. In many YA books, the male interest is nothing more than a shell of witty remarks and great abs. But Ethan is a fully nuanced character, who deeply cares about others and feels the burden of his legacy. Like I said earlier, I absolutely love the world building, the characters and the incredible plot twists. However, there were a few things I wasn`t a fan of. For starters, I wish that the villain was more present in the story. It`s hard to fear something that not there 80% of the times. I also did not like Ethan`s chapters, as I don`t think they added anything new to the story. But overall, I enjoyed the novel and I can`t wait to read the next instalments. It still baffles me how this is Emily`s first novel, as she has such a vivid writing style. The way she was describing Ava`s nightmares was giving me chills and I`m not a person that gets scared easily. A solid 4 out of 5 stars. I am can't wait to read this! I enjoy romance, but if a love triangle is thrown in it always ruins it. Ohh, I love the sound of the main character, Ava! I'm always up for a female lead who isn't afraid to speak her mind! I hadn't heard of this one before so I'm excited to learn more about it!